So there’s this Single Frame Stories thing, which has a weblog and a flickr group and everything, and once a week they post a Prompt, like “grave mistake” or “depth perception” or (this week) “objectification”, and everyone (well, not everyone, but…) either emails their pictures or posts them to the flickr group, and the picture is allowed to have One Standard Tweet’s Worth of text along with it, and they all go up on the weblog for everyone to admire, and there’s no lame “voting” or “winners” or anything (I don’t think), they are just there. And I’d known this was going on because I admire botgirl and Whiskey Monday for (their hawt AVs, and) their enormous creativity, but I hadn’t been doing it myself because really it was good enough that other people were doing it, and I was busy leveling my DK’s Inscription skill and dancing in random Australian sims’ dance clubs, and similarly important things. Best viewed larger, of course, and just what the heck is actually going on is left to the reader and/or viewer. Get there early to get a good pew! RHIANNA, Second Life, Sept. 12 — Torley Linden, Second Life’s “Resident Enlightenment Manager,” has long been recognized and celebrated as a living saint. The First Church of Rosedale announced today that “St. 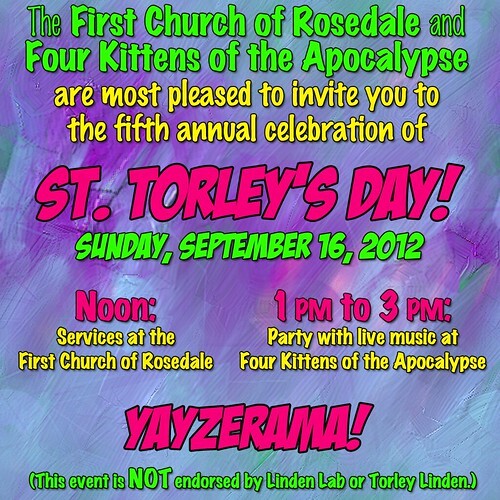 Torley’s Day” will take place on Sunday, September 16, with a a special service at noon, followed by a party at 1 PM. The party, hosted in Penning by Four Kittens of the Apocalypse, will feature live music by popular Second Life artist Kaklick Martin.